William Blake once wrote, “If the doors of perception were cleansed, everything would appear to man, as it is, infinite.” (From Heaven & Hell ). The coloration or filtering of the pure light of divine consciousness comes from imprints (thought forms and behavioral patterns called “sanskaras”) that the individual soul carries through its lifetimes until it unwinds and discards them like old skin. We can think of it this way. As infants, everyone of us are born with a micro-chip in our brain, recordings, deep imprints of our past experiences that are stored in our soul. We carry within us from each new beginning the memories of survival that include our successes, defeats, loves, deaths— and beyond this— transitions between our many lives and deaths on earth. There is a perennial teaching that claims there are three realms of illusion: gross (or physical), subtle (or energetic), and mental (or archetypal). Divine Knowing is cutting with the sword of Truth through illusion by the untainted light and love of Infinite Mind and Infinite Heart. Purified Knowing is seeing with the eyes of the Universal Soul. 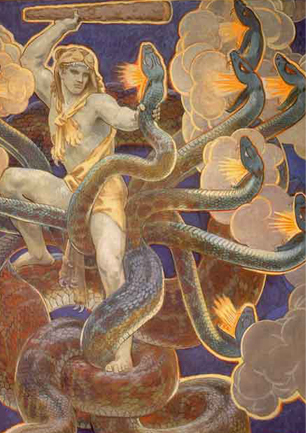 In Hindu archetypal mythology, Vishnu— the Collective Soul of all souls— is aware that it rests upon the multi- headed snake that depicts illusion. The serpent lies still . . . that is, until the soul begins to awaken from its sleep. Once the soul is roused, it begins its journey back home. This perilous path is the road taken by the mystics, east and west. From my own studies I have found the four stages of the mystical way as described by the western mystics correspond to Meher Baba’s path of involution. (Meher Baba treats the theme of the soul’s long path to Realization extensively in God Speaks and Discourses)I discuss the parallels between the stages of the mystical path in western and eastern mysticism in detail in my unpublished book, Across the Fiery Threshold (1999). Here is a brief summary. 2) illuminative —seeing completely by the transfused “light” of the divine, seeing all creation with the sight of God, and corresponds to the 5th plane. 3) unitive —the soul is united/married to God with the emphasis on divine love, including the last trials of fana or “unselfing.” Here there there is still Lover and Beloved and corresponds to the 6th plane. Now, all of this being said, those beginners— or advanced— who are exploring the path to knowledge beyond simplistic belief are generally said to be in the purgative states, on or at the entrance to the mystical way. How does one begin to prepare for such a path? When might one intuit they have arrived at the threshold of the mystical way known by the sages of all climes and times? Here are a few indications. The human soul in the world is making inroads to the doorway of the path when it . . .
2. has ceased gossiping or passing on negativity of any sort to others. 3. has left behind the “blame game,” the “victim” and all this script stands for. 4. has established an observer of its own ego dramas. 5. no longer identifies exclusively with a specific tribal book of law. 6. sees universal elements in the differing religions. 7. becomes more and more aloof to blame or praise. 8. aligns more and more with the Infinite Mind and Infinite Heart that guides the evolution and involution of all creation. Thank you Neale, this is a wonderful checklist and it arrives at a point in my own life where I can recognize, and most importantly, appreciate them. Reading this blog brought a sly grin to my face, and a /facepalm of some “what was I thinking” previous phases of my life. Question, “the soul returns to the stone state of evolution if it abuses its accrued power” Is the warrior persona part of the “stone state”? I know different warriors can be different types/ levels of awareness. What level would say, a Japanese Samurai be? Thanks for your thoughts. Now,about the return to the stone age from those who abuse the 4th plane. The 4th plane of power is a highly advanced plane of one who is on the path toward God-realization. Although there might be an example of a warrior samarai who had arrived at that state, it would be most unlikely. To give you an example of someone who may have attained to this state but abused it would be Hitler. But this is entirely conjecture on my part. Only one who has arrived at a particular state of consciousness can really “know.” If not one can only go on reports from those who know. For instance Meher Baba said of St. Francis that he was raised to the 7th plane of God-Realization. Hmm, ok, I see your point about a samurai. What about a martial arts master like Morehi Ueshiba? I’m trying to wrap my mind around where the warrior person fits into the overall soul’s journey through the planes of enlightentment. Hitler is a fascinating choice here. What are some of the criteria that makes him qualify for the 4th plane, in your mind? And since he’s now featured in a very powerful new movie, how would Lincoln comapre to Hitler? In terms of 4th plane God-realization.